Combine flour, 2 tablespoons oil, 2 tablespoons cornstarch, salt, white pepper, and egg. Add 1 1/2 cups water gradually to make a thick batter. Stir to blend thoroughly. Add chicken pieces, and stir until chicken is well coated. Heat oil in skillet or wok to 360 degrees F (180 degrees C). Fry chicken pieces in hot oil 10 minutes, or until golden. Remove chicken, and drain on paper towels. When ready to serve, layer green peppers, pineapple chunks, and cooked chicken pieces on a platter. Pour hot sweet and sour sauce over top. 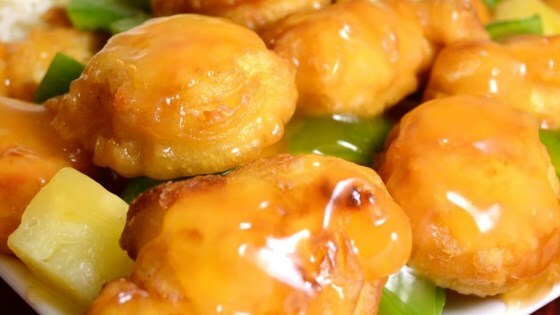 This recipe is authentic and tastes very similar to the restaraunt style sweet & sour chicken. I probably will not make it again though because of the amount of work. Great recipe.